Wheelabrator says the project, which received planning permission earlier this year and is being developed on the Deeside Industrial Park as part of the North Wales Residual Waste Treatment Project. Parc Adfer will unlock supply chain opportunities worth in the region of £14 million during the three year construction period, with a further £30 million being invested to support the facility’s day-to-day operations over its 25 year lifetime. Local companies are being invited to find out more about the array of supply chain opportunities which will be created by Parc Adfer. Businesses can now register to attend the project’s Meet the Buyer event, which is being held as part of Flintshire Business Week at Coleg Cambria on Tuesday 20 October between 07.15 and 19.30. Representatives of Wheelabrator will be present to meet businesses, alongside civil engineering contractor, Sisk Group and Baumgarte Boiler Systems, who will be managing the delivery of the mechanical and electrical packages of Parc Adfer. Plans for the event come hot on the heels of a busy period for Wheelabrator with July 2015 marking its successful completion of the commissioning phase for the Ferrybridge Multifuel 1 (FM1). Through a 50:50 joint venture between Wheelabrator and SSE (known as Multifuel Energy Ltd.), the new West Yorkshire facility has now entered full commercial operations and is capable of contributing around 70MW of low carbon electricity to the National Grid – the equivalent power to meet the needs of around 160,000 homes*. An application for a sister facility – Ferrybridge Multifuel 2 (FM2) – is currently being considered by the Planning Inspectorate. FM2 will have a gross generating capacity of up to 90MW* and a planning decision is expected by October 2015. Other projects being progressed by Wheelabrator across the UK include a combined heat and power plant at DS Smith’s site at Kemsley Mill near Sittingbourne in Kent. This facility will generate electricity but also provide steam to the existing paper mill. Businesses wanting to attend Wheelabrator’s Parc Adfer Meet the Buyer event should register at www.parcadfer.com/supply-chain-event. 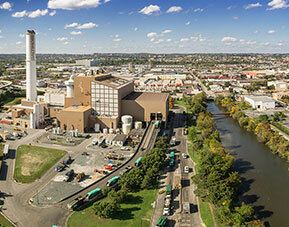 Wheelabrator is a world leading energy from waste (EfW) company operating in North America, Europe and the UK. Wheelabrator is a wholly-owned subsidiary of Energy Capital Partners, an energy-focused private equity firm with over $13 billion in capital commitments.  Wheelabrator has developed, owned and operated EfW facilities for nearly 40 years. Today, it currently owns and/or operates 20 energy facilities in the United States and UK, 16 of which are EfW.